Singapore Festival of Fun 2018 with 70 Shows at Clarke Quay! You are here:Home » Promotion / Events » Singapore Festival of Fun 2018 with 70 Shows at Clarke Quay! The Singapore Festival of Fun 2018 is excited to announce that it will be increasing its StreetFest fun factor this year with 70 shows spread out over more areas around Clarke Quay. This year, besides the Fountain Square, two more locations Read Bridge and Tan Tye Place has been added to showcase street performances from London’s Covent Garden. Audiences will be able to catch more street acts from the 13th to the 18th of March and move with ease from one area to another around Clarke Quay with this enhanced experience. 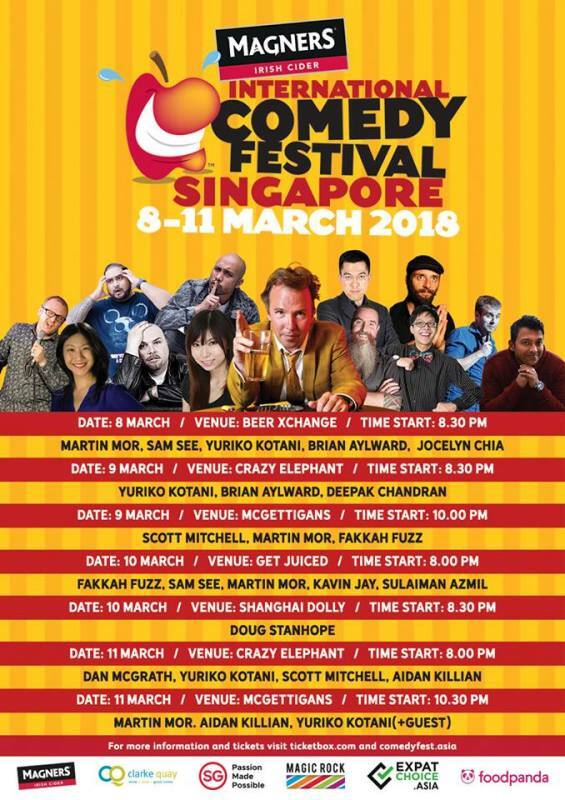 8-11 March (Thursday to Sunday, 8pm onwards): The 5th edition of Magners International Comedy Festival returns to various bars in Clarke Quay with arguable the finest group of comedians ever to step foot in Singapore. Critically acclaimed US stand-up Doug Stanhope, best new comer Yuriko Kotani from the UK, Jim Brewsky from Hong Kong, our very own Fakkah Fuzz and Samuel See; together with 7 others from around the world, they will have audiences laughing out loud and in stitches. 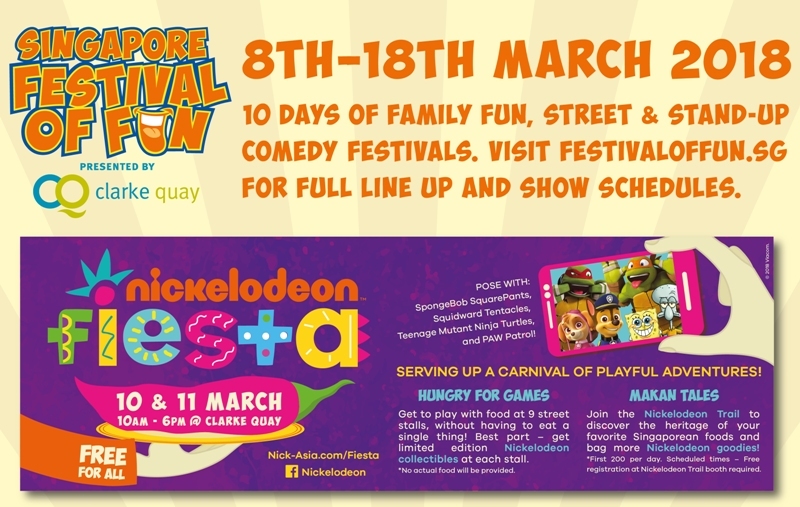 10 and 11 March (Saturday and Sunday, 10am to 6pm): Fun for the whole family, the Nickelodeon Fiesta returns for its second year with a brand new heritage theme in line with Clarke Quay's rich history and celebrates the local passion for food. Expect photo opportunities with Nickelodeon characters, games and lots of collectibles to be won. 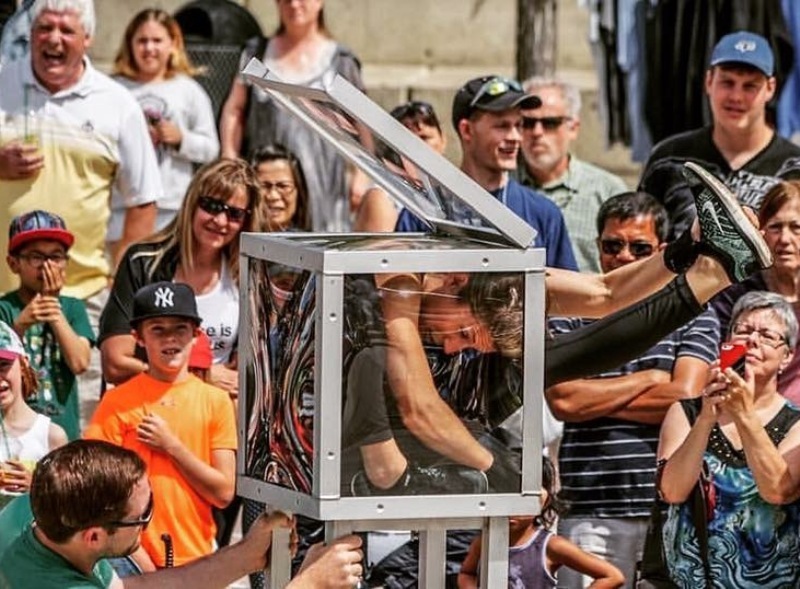 13-18 March (Tuesday to Sunday, 6pm onwards): The very best street performers from London's Covent Garden makes it debut at Clarke Quay's Fountain Square. Catch contortionist Bendy Em twist and turn her body to fit into a small perspex box, basketball in tow, meet Betty Brawn Strong Lady who will perform jaw-dropping feats of strength, be wowed by the stunts of Jump Stilts Extreme, Pancho Libre and escapologist Rob Roy Collins. Or simply take selfies with The Tree. With the added locations and more than double the number of shows taking place, audiences can expect a more enhanced festival vibe and visitor experience. This non-ticketed festival will have street performers engaging people the minute they enter Clarke Quay. Show times start from 6pm to 11pm from the 13th to 18th of March, Tuesday to Sunday. Check out www.festivaloffun.sg for the latest show times as well as exclusive festival deals from a wide array of Clarke Quay outlets. Organised by Magic Rock Pte Ltd, The Singapore Festival of Fun is supported by Singapore Tourism Board’s Leisure Events Fund, and presented by Clarke Quay and partners Nickelodeon and Magners Irish Cider. Sounds like fun for the whole family! Great! Without your introduction, not many will know of this event. I always loved to drink and watch people at Clarke Quay. So happening! This sounds fun. Must be attracting many visitors to Clarke Quay. There's always something going on in Singapore. Fun! Oooh this looks like so much fun. Wish I was in Singapore! So many fun activities!! Have a great week, Shirley! Sound like a lot of fun for the whole family! Sounds like a fun fest. Have a great week. wa..so much happenings line up for Singapore Festival of funs for the whole family to enjoy. Wow, sounds interesting. Wish I can head to Singapore.